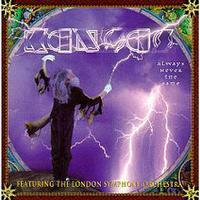 Kansas recorded this album with the London Symphony Orchestra. The whole idea of doing an album with an orchestra has been beaten to death. When it comes to an act like Kansas, though, it’s more of a natural thing. It also works reasonably well. There are a few odd choices, the opener and closer might have worked better in other spots for instance. All in all, though, this is one of the band’s more purely progressive rock releases and quite a strong one at that. This is such a powerful cover of the Beatles classic. Sure, the orchestra brings a lot to the table. The band, though, bring a lot of bombast and power. The vocals really drive it all home. This is a pure symphonic progressive rock take on the tune. It works extremely well and is a great opener, except that it might have made more sense to start with a Kansas song than a cover.. This starts very much like the original with just the guitar and voice. The orchestra comes in after a time, adding depth and power to the piece. The symphonic arrangement far surpasses the kind of classical elements on the original version of this. Starting purely symphonic and mellow, this remains the former while growing away from the latter. It is quite classical in nature. As it really bursts out with energy, it feels a bit like musical theater. The orchestral instruments start this. Then the guitar joins and we’re off into Kansas brilliance. The orchestra really brings a lot to the table over the top of the arrangement. This has always been such a powerful and magical piece. If anything the orchestral version brings even more magic to the table. This song has always been a real progressive rock roller coaster. The orchestral treatment adds to and intensifies that. The orchestral elements are mostly prominent here on the mellower sections. This is a cut that alternates between harder rocking and mellower movements. It’s more of a straightforward rocker, though. There is a drop back to purely symphonic elements mid-track. Keyboards start this and are quickly joined by the orchestra. As this builds out from there, it is obvious that the orchestra adds a lot to this. Then it drops to acoustic guitar and the cut starts to evolve again from there. If anything the symphonic treatment makes this one more purely progressive rock. It’s always had a great balance between the mellower and the harder rocking. That even seems to get intensified here. The prog rock jam mid-track benefits from the orchestra, too. The orchestra brings this piece more into the progressive rock realm. The emotion of the vocals remains in place here. I really love this song as performed here. It’s a powerful and evocative number. This has a lot of orchestral bombast at the start. It’s over a minute in before the orchestra drops away and leaves just the guitar. The guitar works out from an acoustic section to a bluesy rocking one. The vocals come in over the top and this is a straight rock treatment (minus orchestra) at this point. It works out from there as they continue. At the more melodic rock based movement comes in, so does the orchestra. The bass takes us along a cool path when it leads back out into more pure rock. Then the orchestra joins as this instrumental section continues. It works to more pure symphonic territory with some operatic vocals. We’re taken back into the song proper from there. The orchestra at times make this part feel a little jazzy. This is a classic Kansas song. The thing is, this is one case where the orchestral arrangement just doesn’t seem to gel all that well. Rather than augmenting the magic, it seems at times to replace some of the Kansas artistry with less effective symphonic elements. It’s a good song, but I prefer the original. It’s also one of the least successful numbers here. Another purely symphonic piece, there are both bits that call to mind musical theater and sections that are recognizable Kansas quotes. After that introduction, and given the lack of success on the previous Kansas classic, you might come into this one with some trepidation. Don’t fear, though, they do an exceptional version here. The song really rocks and the orchestra adds a lot to the experience. A Beatles-like ballad, this is pretty and the orchestra adds some charm. It does get more powered up later in the track. A symphonic flourish gives way to a piano ballad approach. The song grows and the orchestral arrangement really adds to the magic here. I’m not sure that this was the best choice for closer, but it works well.